This Potato-Greenpeas Masala is an easy, tasty and popular side-dish only needs 9 mins microwave cooking-time. This side-dish is the best combination for rice with sambar or Curd Rice or rasam or chapathis. Take a microwave bowl and mix all the ingredients with 3/4 cup water and Microwave(high) this mixture for 9 mins. 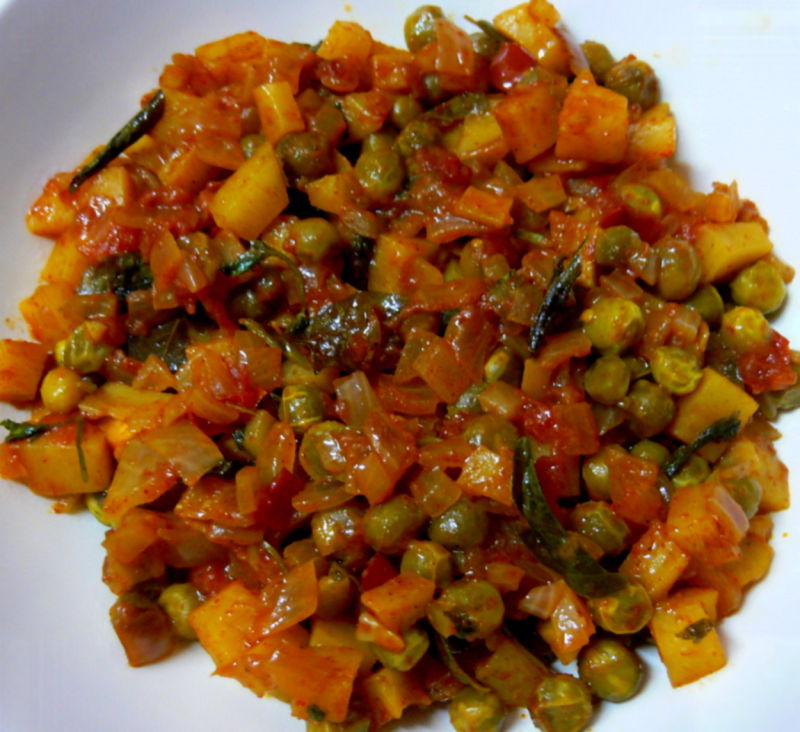 Serve this Potato-Greenpeas Masala hot with rice and sambar or rasam or Curd Rice or chapathis. Dear Sonu!,its lot easier to cook using MW Oven (if u begin trying few recipes using MW.Oven,u will hate to cook with gas) and many don't know that. I learned it(self) few months back when I happened to cook without gas cylinders for a week and thought that I might share these recipes with u all. Most of ur recipes are gaining popular among viewers.It's a great way to learn how to cook in microwave from u. Potato lovers,please try this recipe.It tastes so good.U can use 1/4 tsp cinnamon powder instead of mutton masala.Even u can try this recipe in 2 steps or 3-like seasoning or tempering first(M.W on high for 2 mins) and then add the other ingredients and M.W on high for 9 mins with water.If u want the potatoes to be tender,just add 1/4 cup water again and M.W on medium for 5 mins.